PRESIDENT BUSH GREETS PRESIDENT FOX ON THE SOUTH LAWN. THEY WALK TO THE WEST WING AND LOOK AT THE VIEW FROM THE COLONNADE. THEY MEET WITH CONDOLEEZZA RICE, AL GONZALES, ANDY CARD AND KAREN HUGHES. PRESIDENT BUSH AND PRESIDENT FOX ARE PICTURED ALONE IN THE OVAL OFFICE. THEY WALK DOWN THE SOUTH LAWN SIDEWALK TO A PODIUM ON THE SOUTH LAWN. THEY DELIVER A JOINT STATEMENT. 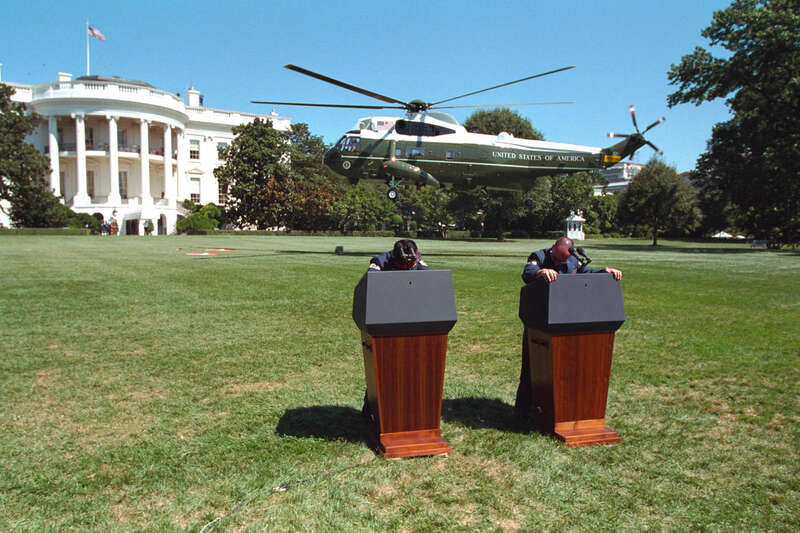 PRESIDENT BUSH AND PRESIDENT FOX WAVE PRIOR TO BOARDING MARINE ONE (WHITE HOUSE WEB SITE PHOTO P6812-18). THEY FLY TO ANDREWS AIR FORCE BASE EN ROUTE TOLEDO, OHIO. SHOWS STAFF WALKING TO A NIGHTHAWK HELICOPTER AT THE LINCOLN MEMORIAL LANDING ZONE. PRESIDENT BUSH AND PRESIDENT FOX ARRIVE ANDREWS AFB ABOARD MARINE ONE. THEY WAVE BEFORE BOARDING AIR FORCE ONE. THE PRESIDENT MEETS WITH PRESIDENT FOX AND THE MEXICAN DELEGATION IN HIS AFI OFFICE. PRESIDENTS BUSH AND FOX TALK WITH AIR FORCE ONE GUESTS DURING THE TRIP.